In family life, there's so much to love—the laughter, the little adventures and the days filled with play. But with that fun can come a mess—more specifically the mess that accumulates when you have less time for organizing than you'd like. Finding yourself in a home that's overflowing with stuff isn't unusual, but it can leave you feeling a little out of control. The family that talks together, organizes together. But in all seriousness, if you start discussing the need for organizing ahead of time, the family unit will be better prepared for it. Any parent who has high hopes for a clean home should make it a point to begin that conversation early. Prep your kids (and your spouse!) by letting them know that the family is going to be working toward a common goal: to have everyone's space cleaned up, organized and streamlined, removing any clutter and unneeded items. It doesn't immediately sound fun, so let them know that you have plans to make it an enjoyable and rewarding experience. Without a plan, you're not going to be as successful as you'd like to be. Set goals for the family. Are your closets overflowing with clothes that don't fit anymore? Are your winter and summer clothes all mixed together, confusing everyone as to which month it is? Are there certain rooms that have taken on a life of their own? Set goals to get those places and things organized. At the same time, make sure your goals are realistic so that you (and your family) aren't disappointed when you can't organize every aspect of the entire household in one weekend. You want this to be as enjoyable a process as possible, so keep it simple. Even as adults, a little treat can certainly motivate. To keep the organization train moving, schedule regular breaks after you accomplish a portion of your work. Did the kids move all their unwanted toys to Goodwill boxes? Did your husband move the boxed-up winter gear to the basement (finally)? Find a reward that will keep everyone on track. Order pizza for lunch, have a quick dance party, walk to the corner store for a treat…whatever your family loves to do, make it a reward for getting their work done. With each segment of work completed, make sure to encourage your crew and tell them what great work they've been doing. A positive attitude can go a long way. Find new homes for previously loved items. Cleaning and organizing your home can be a touch overwhelming—sometimes so much so that you feel like just throwing everything away and calling it quits. Don't! When you find items that you no longer need but are still in good shape, create a pile to be donated or sold. You can sell unworn or gently used clothing to consignment shops. Some online consignment stores, like thredUP.com, will even send you a prepaid bag you can use to send in your unwanted clothing, which makes it super easy to get everything out of the house fast. There are also plenty of donation centers where you can drop off toys and furniture—or, if you live in a busy neighborhood, set your unwanted furniture at the end of your driveway for your neighbors or passers-by. (Just be sure to add a note saying it's free.) As with this whole process, make sure to talk with your family about how good it'll feel to have these things out of your home and that the items will find new homes with other families who can appreciate them just as much as you did. Now that everyone in the family has created a calm and clean space for themselves, you can all relax and recharge for your next family adventure. Just make sure you're clear with your nearest and dearest that if you're not careful to keep up with clutter, it'll start to pile up again. 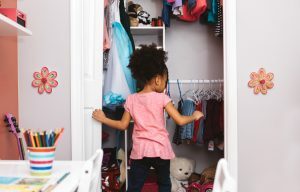 Find time in your daily schedule to tidy up and remove unworn or outgrown clothing from the rotation. Additionally, schedule another day or weekend of organizing in the future to make sure you stay clutter-free. Your home is a sanctuary where you and your loved ones can have fun and laugh together. Regular cleaning and organizing means you can enjoy family time without the stress of an overflowing closet. With two kids, Amanda Light has had her fair share of clutter build-up, and she provides tips on how to tackle it. She writes for her blog, Prim and Propah, and for thredUP.com, an online and offline consignment and thrift store where you can sell your used and unworn clothes.